Posted: Friday 1st August 2014 in Events and Awards, News. In 1989, Tim Berners-Lee proposed a system of interlinked virtual documents to be accessed over the internet within a browser – and so the World Wide Web was born. It took him and his team 2 years from proposing the concept to uploading the world’s first web page. For a system that was in its infancy just over two decades ago, the WWW has advanced at lightning speed and changed life in the western world. It’s made the world bigger and smaller at the same time – opening up access to information that had previously been the reserve of libraries and experts. This democracy of information has revolutionised industries such as retail, publishing, gambling and music. It’s spawned entirely new business sectors and jobs. Politicians have risen to the top and dictators have been toppled thanks to the social media networks that connect people around the world. Its inherently open foundations have created a veritable playground allowing those with an idea and a little nous the opportunity to make their millions or even billions. It’s been the 21st century’s version of a gold rush complete with its bust and boom periods. So in recognition of World Wide Web day we’ve taken a trip back to its very beginning and looked at what key events, applications and businesses have helped to shape the web that we know today. Without the internet there would be no web. The internet describes the networking infrastructure that connects computers together, upon which Berners-Lee and his team created their information sharing model known as the World Wide Web. 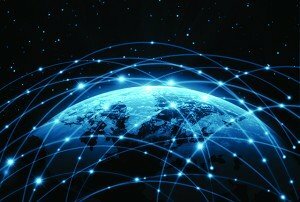 The internet was born out of ARPANET (Advanced Research Projects Agency Network); a network which allowed for grouping of transmitted data into blocks, called packets, to allow computers to communicate with each other. It replaced the traditional circuit system which was used to connect telephones, for example. ARPANET was developed for use at universities in America and was funded by the US Department for Defence. Robert Morris was a 23 year old American student who was arguably the first person to breach internet security. He created a computer worm which was responsible for slowing down the operations of many of the 60,000 computers connected to the internet at the time. Morris claimed he ‘wanted to count how many machines were connected to the internet’. The first notable instance of black hat hacking, the term given to incidents of security violation motivated by nothing beyond ‘maliciousness or personal gain’, was in 1994, when unidentified individuals broke into the US Air Force’s main command and research centre in order to access classified information. Developed by Netscape, Secure Sockets Layer (SSL) is an encryption format that forms the backbone of all secure transactions on the web. 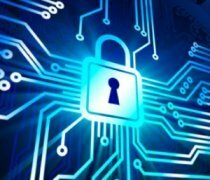 As the internet grew in popularity, communication security became a key area for concern. Chief scientist at Netscape, Dr. Taher Elgamal, wrote the basic algorithm for SSL Version 1.0 in 1993. The latest incarnation, now known as Transport Layer Security (TLS), is widely used in applications for web browsing, email and instant messaging. Adobe Flash is a multimedia and software platform used to add streamed video, audio, adverts and interactive multimedia content to web pages. It is used widely and is available as a plugin on all major web browsers, however more recent developments such as HTML5 (see below) look to be overtaking. In 2011 Adobe announced they would not be developing Flash for mobile devices. WebCrawler was the first search engine to allow users to search for websites using any word appearing anywhere in the text of any page on the site. Several tools for searching the internet had existed before this became the standard, but the first to gain real commercial success came later in the same year with the creation of Lycos. Michael Loren Mauldin created search engine and web portal, Lycos, as part of a research project while at Carnegie Mellon University. It became the most visited online destination worldwide by 1999, with a presence in more than 40 countries. Currently owned by Indian marketing company, Ybrant Digital, Lycos still operates a search engine and has mail, video, social and chat functionalities. 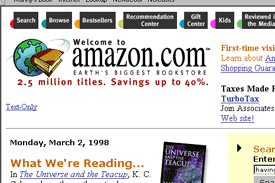 Bezos as a humble online bookstore back in 1994. Over the past 20 years the business has diversified to sell electronics, clothing, food, toys, homewares, furniture and more. The site was initially named Cadabra but was changed to Amazon in 1995 as it was feared that the original name was too phonetically close to ‘cadaver’. In 2007 Amazon released the Kindle, its own e-book, and in 2011 moved on to create a tablet, the Kindle Fire. More recently the company has moved onto smartphones and television services, releasing the Fire Phone and the Amazon Fire TV set-top box in 2014. Amazon currently employs 132,600 staff and made $74.45bn in revenue last year. Java is one of today’s most popular programming languages, and many desktop and mobile applications, such as live chat, light boxes and the majority of Android apps depend on it in order to function. It was developed in 1995 by James Gosling at Sun Microsystems, Inc., a company that sold computers, computer components, software, and information technology services. eBay is an online marketplace founded in 1995 by Pierre Omidyar. The first item sold was a broken laser pointer, for which Omidyar was astounded to receive nearly $15. On contacting the buyer he discovered that there could be a market for almost any product; a theory that was confirmed over the following months, when traffic to the site increased to an extent that Omidyar was informed he would need to upgrade his internet service to a business account. eBay is now a multi-billion dollar business operating in more than 30 countries. Sabeer Bhatia and Jack Smith launched one of the first web email services from California in 1996. It was considered unique in that it allowed users to access their mail via a browser from anywhere in the world. The name was chosen as it contained the letters HTML (referencing the markup language – see HTML5 below). Hotmail was sold to Microsoft in 1997 for $400m and became the most widely used email service in 1999, with more than 30m active users. It was upgraded to outlook.com in 2012 and in 2013 reportedly had 400m active users. 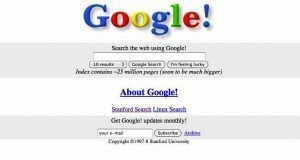 Google creators, Larry Page and Sergey Brin met at Stanford University in 1995. They teamed up to create an internet search engine, originally called BackRub, with their mission being ‘to organize the world’s information and make it universally accessible and useful’. Google, a play on the word ‘googol’ – the mathematical term for a 1 followed by 100 zeros – came into being in 1998 when Page and Brin set up their first workspace in a garage. PayPal was created in 1998 by financial company, Confinity, as an online alternative to traditional payment methods. It rapidly grew in popularity in 2001 due to its use on auction site, eBay, which a year later opted to purchase PayPal for $1.5 billion. Today, PayPal operates in 203 markets and has 148m active users. The Internet Corporation for Assigned Names and Numbers is responsible for domain names; unique identifiers related to the namespaces of the internet. The domain name system (DNS), serves as a huge digital phonebook for computers, services, and other resources connected to the Internet. ICANN continues to operate today as a non-profit corporation which develops and maintains policy on this expansive naming system. IE5 was a web browser created by Microsoft and running on Windows. Microsoft spent over $100 million per year in the late 90s, with over 1000 people working on IE by 1999. IE5 achieved over 50% market share by early 2000 and 80% by 2001, overtaking other browsers such as Netscape. However Microsoft encountered multiple lawsuits worldwide as other browsers such as Netscape and governments deemed their bundling of IE with its other software as a breach of antitrust laws. Microsoft eventually lost the lawsuits but the settlements were largely regarded as a slap on the wrist. by the Record Industry Association of America, rapper Dr Dre and metal band Metallica caused the company to cease operations and eventually sell to Roxio. It now operates as a paid subscription music service run by Rhapsody. 1997-2000 saw huge and rapid rises in equity value of technology and digital companies thanks to growth in the Internet sector. Vapourware businesses, i.e businesses built on the idea of a product or service that wasn’t yet built, popped up everywhere. In a trend that was in line with previous boom and bust cycles, over enthusiastic investors bet on businesses with sparkling claims based on hyped up projections in a sector they knew nothing about. In March 2000 stocks began to fall with the judgement on the Microsoft anti trust case viewed as the main catalyst for the dramatic fall of the NASDAQ in April 2000. The next 12 months saw multiple well established and new dotcoms disappear. The crash caused the loss of $5 trillion in the market value of companies from March 2000 to October 2002. By 2000 Google had established itself as the most popular search engine in the world, and began to branch out into advertising. AdWords allows paid-for listings surrounding the natural search results, and has become the centre of many a digital marketer’s universe. It began as a monthly subscription, for which Google would set up and manage campaigns on behalf of companies. The self-managed service quickly followed, and Google set up its Advertising Professional Program to certify users who completed AdWords training. It is estimated that Google derives at least 96% of its revenue from paid ads. Wikipedia is a collaboratively edited online encyclopaedia, containing 30m articles in 287 languages. Created by Jimmy Wales and Larry Sanger in 2001, its name is a portmanteau of the words wiki (Hawaiian word meaning fast) and encyclopaedia. Wikipedia amassed over 8000 articles in its first 8 months of operation, and at its peak had 1800 new articles added each day. It is a non-profit organisation and can be accessed online for free. iTunes is a media player and library used to download and play audio and video files. Originally named SoundJamMP, iTunes got renamed when it was purchased by Apple in 2000. It was further developed by its original creators and was released the following year, with a revised version coming out 9 months later to coincide with the release of the first iPod music player. Users are able to purchase songs and store and play them in a personal library. Myspace is a social networking service launched in August 2003 in California. Founded by Chris DeWolfe and Tom Anderson, it was sold to News Corporation in 2005 and subsequently to Specific Media LLC and singer, Justin Timberlake, in 2011. At its peak Myspace was the most popular social networking site in the world, even achieving more US visitors than Google in June of 2006. However after Facebook was created and began to grow in popularity Myspace started to fall out of favour, and by June 2014 had reduced its staff from 1600 to just 200. Mark Zuckerberg founded social networking site Facebook, originally named The Facebook, with his Harvard university roommates in 2004, making it available to fellow Harvard students only. As popularity grew Facebook was opened out to include other universities and, eventually, the general public. The site allows people to build a personal or business profile through which to share photos, statuses and messages with their friends and followers. Zuckerberg remains the primary owner of the business, which was valued at $104bn in 2012 and had amassed 1.23bn active users by early 2014. In 2005 Google launched Google Earth and Google Maps, using satellite imagery and aerial photography in order to create a virtual globe accessible via the web. They can be used in a variety of ways, most commonly for directions, route planning and locating local amenities or businesses. Google Earth has been downloaded well over a billion times, and Google Maps is the world’s most popular app for smartphones. In 2005, three former Paypal employees, Chad Hurley, Steve Chen, and Jawed Karim, branched off together to create video sharing site YouTube. Registered users are able to upload and share TV clips, music videos, video blogs and other video clips on the site, which can be viewed by registered or unregistered users. Less than 18 months after the first video was uploaded, YouTube reported that 65,000 new videos were being uploaded every day. In 2006 Google acquired the company for $1.65bn. Today, 60 hours of video are uploaded to YouTube each minute. Founders Jack Dorsey, Evan Williams, Biz Stone and Noah Glass held a daylong brainstorming session to come up with Twitter, the name for which was inspired by the word’s definitions: ‘short bursts of inconsequential information,’ and ‘chirps from birds’. The social network/microblogging site allows users to write updates of 140 characters or less and share with followers. The site grew extremely quickly, going from 400,000 tweets per quarter in 2007 to 65m tweets every day in 2010. Twitter is especially popular on mobile, with 60% of tweets in 2013 coming from mobile devices. HTML5 is a core technology markup language used to create online content. Developed by the Web Hypertext Application Technology Working Group, it is the 5th revision since standard HTML was created in 1990. HTML5 was designed to offer better cross browser support and less necessity for additional plugins, and was built with consideration for being able to run on low-powered devices such as smartphones and tablets. Google’s latest major development is the release of wearable technology, namely Google Glass. Worn on the face like glasses, Google Glass shows information in a similar way to smartphones and allows users to communicate with the internet with voice commands. Google Glass allows for virtual reality to be brought into the real world, which has various implications that will impact on digital marketing. Glass will enable more data to be captured on individuals, and more information to be presented to them relevant to where they are and what they’re doing. It’s the next level in connectedness. WWW Day is celebrated in August each year, as a nod to the first time that the Web was available to users: 23rd August 1991. Modern life has been immeasurably shaped and transformed by the internet; people are able to trade, communicate, read, learn, travel and more in just a few clicks. We can access a world of information and media from the comfort of our own homes or remotely while out on the go. The web has evolved vastly in its 23 years and has unlimited possibilities for the years ahead. 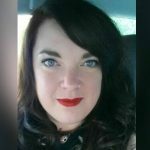 If you have any questions or would like to know about how Summit can help you make more money online please contact Neil Collins on 0203 428 5307.